Figure 1 – Total article reads over time (No Archive Hits Shown) and the total number of reads per month. Can anyone guess why Sept is the most popular month for reading blog articles? Between May 2013 and Dec 2015, I conducted a 2.5 year long blogging experiment. These articles document what I learned during and after completion of this experiment. I wrote over 160 technical articles focused on Tableau and Alteryx during the experiment and many interesting findings were made. 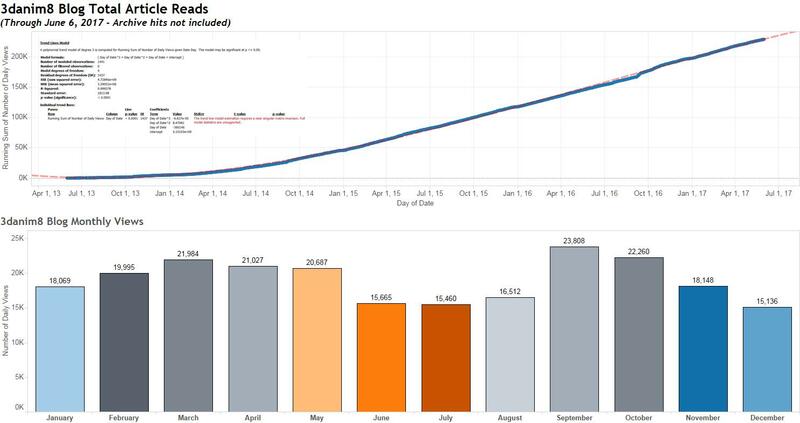 It was in June 2013, on a beautiful spring day in Knoxville, TN, that I decided to create my Tableau blogging experiment. This experiment has been published on WordPress.com in a blog called “3danim8’s Blog”. I really only had one question I wanted to answer by writing this blog. I wanted to know if people would read my blog if I took the time to write it. Well, I now have that answer. However, there was another reason for me doing this work. I was running a secret scientific experiment designed to help me be the best technical blogger possible. Looking back on the experiment, not only can I quantify how many readers read my blog, I can also determine how long it took them to discover my work. Additionally, I have learned what readers like, what they don’t like, and what they are indifferent about. In other words, I have learned a lot. Now it is time for me to share some more of those insights with you as I close this experiment but continue my future work as a technical blogger. Click here to learn about lessons learned (part 1) during the experiment. Click here to learn about lessons learned (part 2) during the experiment. Click here to learn about how I assess the performance of my own blog. Click here to find out which Tableau bloggers you should consider following. Click here to learn about you can gain value from Tableau blogs. Click here to review the aftermath of the experiment and why I was frustrated with one aspect of what I was unable to do during the experiment. Part 2 – Quantifying the importance of using the terms “How, How To, How To Use” in blog titles. Part 3 – Determining the importance of articles that are either fast out of the gate or slower performing over time. Part 4 – Processing the asynchronous time series data from the experiment. Click here to understand that not all web page measurement systems are equal. Click here to view a word cloud that represents the 3danim8 article history. Click here to search the entire 3danim8 blog library for any word. Figure 2 – The highest performing article category/subcategory combinations are shown here, based on a cluster analysis of total reads and reads per article. Currently, Power BI articles are outperforming all other categories, with Tableau techniques and Tableau mathematics coming in second and third place, respectively.